I spent the last two weeks of September in Charlotte for work. I had the best intentions too. I mapped out 10 trails to ride for the weekdays, and I was going to hit Pisgah on Sunday. The weather and my health were against me. I went riding 3 times, got sick and then it rained for most of the last week. Monday Cricket took me to Springs Center in South Carolina. Great trails, fast and very few roots and almost no rocks, but a little light on the climbs. My gps logger wasn't working right, so no maps of what we did, but It was around 11 miles. No pictures either. Tuesday I hit up Renaissance park. It took me a while to find the other half of the trails. Flat as a pancake, but fast and fun. Wednesday I hit up the White Water Center. It costs $5 to park there, but it's worth it. fast flowy, and finally some climbs. I only managed 11 miles, but Cricket said I missed a big chuck somewhere. my map is incomplete of that, but the 11 miles I did correlates with the Tarheel Trailblazer's site. Check them out for the map of all the trails in Charlotte. After that I was sick in bed until Saturday. 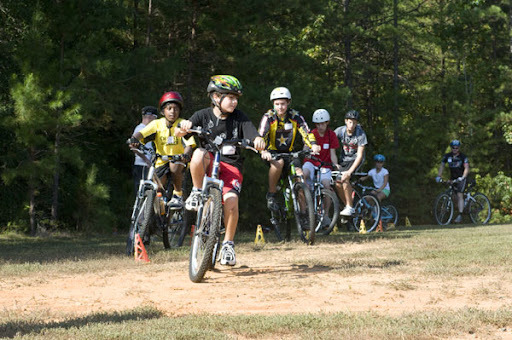 Saturday morning I met up with Cricket and Grayson to do a mountain bike skills clinic for diabetic kids. We had 3 teenage boys 2 younger boys and 2 girls, and Grayson. They did a slalom course, learned how to hop over obstacles(logs), limbo, and a little tabletop ramp. After doing that we split into two group and rode. I rode with the younger kids which was super fun. Sunday Cricket and I met Chris at Colonel Francis J. Beatty Community Park, another fast and smooth trail. Cricket loaned me her Superfly single speed. Very nice frame, but geared a little low for me. We spent most of the ride in the pouring rain, luckily the trial held up as we rode. The rest of the week was a wash(no pun intended). We finished up with some road intervals on our mountain bikes for a little less than 2 hrs. Back in Cincy on Sunday I did the Tower Park race. There weren't too many people since there was a cyclocross race in KY. It was nice and cold around 49 degrees. Three laps with a heinous climb to start. I was infront for most of the 1st lap and 2nd lap, until Darrin passed me when I was walking up a short climb to the double track. I kept him within my sights as best I could, and then I was passed by Bill when my left leg locked up on another hike-a-bike section. I was pretty cooked by then, but I kept up with them and finished 3rd, and 1st in my age group. Pretty happy with that, and that clinches my lead on the CORA points series. That's just about it for the race season. 12hrs of the Hill of Truth is coming up but I might miss it because of work.